Surely, too, a group retrospective of the above-named pioneers of British photojournalism [Tony Ray-Jones, Graham Smith, Chris Steele-Perkins and Brian Griffin] is long overdue? My instinct is that this kind of work has long been out of fashion with our arbiters of culture in Britain. It is black-and-white, gritty, hard hitting and politically provocative – the photography critic, Gerry Badger, correctly described In Flagrante as “taken from the point of view that opposed everything Thatcher stood for”. I’m not sure it’s true that we’ve lost our appetite for that kind of work – maybe some of it’s now under the “street photography” umbrella. But with the film, the economy grinding along the bottom, and the Argies getting one-eyed about the Falklands again (let’s see if they give the pampas back to the native peoples), it does seems the right time for a Thatcher-era retrospective. 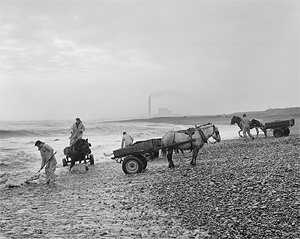 Anyway, Killip is one of my long-time favourites, so much so that I still remember being blown away when I saw big prints of these two pictures, and he currently has a small web site. As well as some pictures which didn’t get in the retrospective, there is a slideshow of his series Seacoal.